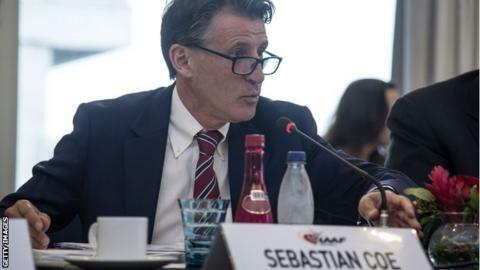 IAAF president Lord Coe's planned reforms of athletics' world governing body have received overwhelming backing from member countries. Coe's Time for Change package, designed to tackle corruption and doping scandals, won a 95% majority from the 192 who voted in Monaco. "Our sport, our family, is under threat," said the Briton, 60. "Sitting out the fight is not an option." Coe wants women equally represented on the IAAF ruling council by 2023. In addition, council members - including the president - will be limited to no more than three four-year terms. A new integrity unit will handle doping cases involving international-level athletes, designed to speed up the disciplinary process and make punishments more uniform. "This is a very important moment in the history of our sport," added Coe, who received 182 votes in favour, 50 more than the two-thirds majority required. "We're putting in place a framework that should have been there years ago." Several Congress members expressed concern that there would be an open ballot where each member's vote was displayed on a screen and coloured green for yes, pink for no or white for a failed vote. Asked why there had not been a secret ballot on the day, Coe - who won 1500m Olympic gold in 1980 and 1984, replied: "Because we have moved into the world of transparency."